Keenum went 1-of-4 for five yards against his former team. Case Keenum played just six snaps in his preseason debut with the Broncos against the Vikings on Saturday night, but he&apos;s already being roasted over an open fire by Denver media. Mark Kiszla of the Denver Post scorched Keenum, saying Broncos legend and vice president John Elway doesn&apos;t know how to pick quarterbacks. "Keenum looked like a journeyman. Yes, he played only six snaps. But the Broncos went nowhere. The chains never moved. One completion in four attempts. A misfire on third down to Courtland Sutton." It didn&apos;t help that the quarterback Broncos star linebacker Von Miller publicly lobbied for Denver to get just so happens to be Kirk Cousins, who signed with the Vikings and looked fantastic in his only series of the game. 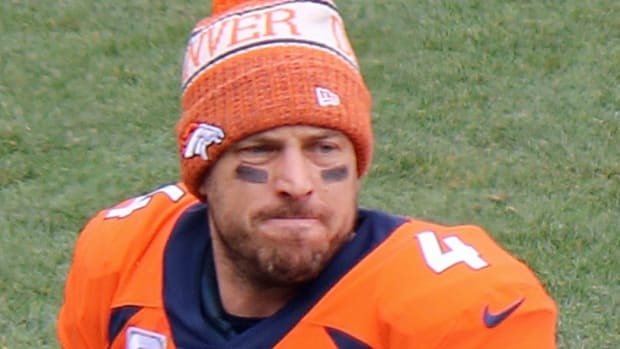 "If Elway really, truly believed the Broncos were one QB away from Super Bowl contention, it’s hard to fathom him choosing Keenum over Cousins." Kiszla said Keenum might be able to lead Denver to the playoffs, but "the Vikings could get fitted with Super Bowl rings with Cousins as their quarterback," later adding: "You get what you pay for." Keenum finished 1-of-4 for five yards as Denver went three-and-out against Minnesota&apos;s first-team defense and second-team defense. Now might be a good time to tell Kiszla that it was the first preseason game and Minnesota has the No. 1 defense in the NFL last season. The guy never had to shovel his driveway in Minnesota. Broncos fans are unhappy with the former Vikings QB. Will the Vikings face the Eagles on Thanksgiving night? All three are playing with new teams this season. Keenum took the high road in an interview with Denver media. Zimmer did not say for sure that Keenum will start this week against the Rams.